SANTA BARBARA — An eight-hour saga of love gone awry Thursday began weeks ago when the girlfriend of Jose Miguel Ortega, 28, removed herself and their child from his residence in mid-town Santa Barbara to relocate in her parent’s residence just a mile away. On May 5, Ortega called his estranged girlfriend, insisting that he was experiencing suicidal ideation and wanted desperately to see their child. After this request was refused, Ortega drove to the girlfriend’s parent’s home between the hours of 1 and 2 a.m. Thursday and entered the residence through an unlocked door. 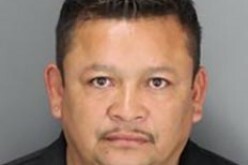 Once inside the home, Ortega found his former girlfriend asleep on the sofa and summarily attacked her and stabbed her repeatedly in the face and head. The screams of the victim alerted other family members and Ortega was chased out of the residence, observed by witnesses as driving off in a white Ford SUV. Just a quarter hour later, California Highway Patrol officers, responding to reports of a traffic collision four miles from the stabbing scene, discovered Ortega’s vehicle crashed and abandoned. 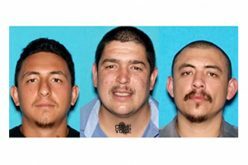 With Ortega’s vehicle description already on their updated watch-for list, and Ortega reported as armed and dangerous, the Santa Barbara County Sheriffs Department dispatched canines and an aerial search by helicopter. According to spokesman Drew Sugars, Ortega was not found and the county’s Reverse 911 Protocol was activated, alerting residents in the Montecito-Summerland area to the possibility of home invasion attempts by Ortega. “Detectives didn’t wait for daybreak to conduct an aggressive investigation,” said Santa Barbara police Lt. Paul McCaffrey. Ortega was tracked to the home of a Santa Barbara acquaintance who was unaware of the events leading to his pre-dawn visit. According to McCaffrey, lead investigator Det. Jose LaTorre, with ample patrol support surrounding the residence, apprehended Ortega without further incident. 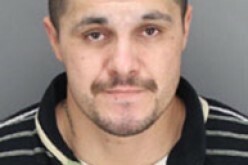 Ortega was booked at Santa Barbara County Jail on felony charges of attempted murder, spousal battery, burglary, child endangerment, and hit-and-run driving, with a bail set at $500,000. 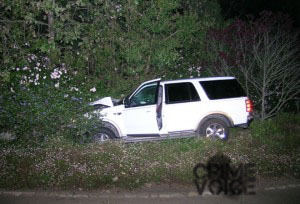 Jose Ortega’s crashed Ford Explorer discovered by CHP following assault of his girlfriend.